The Seagate Backup Plus Fast portable drive offers up to 2x the capacity and performance compared to other 2.5-inch portable drives. The metal design protects 4TB of storage, so you can carry your movie, music and photo collection wherever you go. The drive also optimizes the speed of the fast USB 3.0 interface with transfer speeds up to 220MB/s - giving you the ability to quickly transfer files, and work on graphic or video projects directly from the drive. The drive is fully USB powered and does not require an external power supply - allowing you to carry as many videos, songs and photos as in a 3.5-inch drive in this compact portable drive. Install the NTFS driver for Mac, and you can use the drive interchangeably between Windows and Mac computers without having to reformat. Via the Seagate Dashboard software, you are provided with tools for local, mobile, cloud and social media backup. Run a one-click backup or schedule an automatic backup plan to protect your files in your Backup Plus Fast portable drive at your convenience. Install the free Seagate Mobile Backup app on an iOS or Android mobile device to back up all of the pictures and videos from the device to your external drive or the cloud. 0.88" x 3.25" x 4.60"
Cons: after not work anymore I decide to open box and I find two Hard drive inside and it not from Seagate hard drive It is Samsung hard drive. It seen broad (where between connect usb to Hard Drive) may not working anymore. Pros: 3X speed of regular USB 3.0 drive on reads & writes. 3.6 TB (after formatting) is wonderful amount of storage! Other Thoughts: You won't be disappointed with this drive. I now have 2, they are so good! Note that this is actually 2 x 2 TB drives configured as RAID 0, which is how it gets to be so fast. Pros: Largest Capacity single HD mobile drive that I can find. Pros: If you can get it to work, transfer speeds are quick. Cons: Will not work without an external AC power supply. Other Thoughts: I've tried the drive on 2 different desktops and 1 laptop with USB 3.0 ports and none had enough power to get the drive to work. Light would come on, but you could hear the drive spinning at variable speeds and popping in and back out of the computer's drive list. Adding an external AC supply to the mix got it to power up reliably, but after about an hour of solid data writes (my intended use is a backup 3TB of data), it crapped out and was no longer recognized by the computer. A few days later, I tried again and the drive was back to working which made me suspicious of temperature issues. This time I loaded some SMART drive monitoring software before trying again. Sure enough, after about 20 minutes, the drive temperature was being reported as 128 Fahrenheit and was still climbing. It's a plastic case (ie a thermal insulator) that just can't get the heat out when under high load. I had transfer speeds up to ~150MBps, so the drive is fast if you can get it to work, but it can't sustain that rate for more than a few hundred GB of data. If the point is to be able to reliably back up 4TB of data, it fails miserably. Very disappointed in this drive. Pros: Works great as a portable hard drive as expected. Pros: Fast external drive with no need for an external power adapter. Cons: Seems to overheat after an hour or so of use and causes my games to stop loading and freeze on my Xbox One. Also, it comes with a USB cable that is only about a foot long. Other Thoughts: I have tried several basic things to keep the drive cool. I bought a 6 foot long USB 3.0 SS cable for it and moved it away from my Xbox and other sources of heat. Tried elevating the drive about an inch off the surface with just something holding it up at the sides. If I put and keep a cold ice pack on top of it, I can game and download for hours with no problems, such a hassle though. Pros: 4 TB, decent price, smallish usb drive for 4 TB. Cons: I have had several issues getting computers to recognize this drive at times. It feels like the drives controller or something gets hung up at times. Occasionally explorer.exe will hang when I plug it in, and then I move it to a usb 3.0 port and it's fine. I was finally able to figure that out and work around it. Although it's not 100%, and I copied ~2 TB of personal data on it and there is a lot of corrupt files? Seems like a similar issue to Christopher c. The files copy over to the drive perfectly fine, and they even have the correct file sizes, I can pull them up in winhex and there is data there, but no metadata for movies for example. So it won't play, VLC basically throws the file up. Without looking too much more, it's like the headers are messed, or something similar. I've formatted the drive a couple times, and started copying over 2TB a couple times... that takes a while, even over gig ethernet from a NAS box. And it doesn't seem to matter where I copy from, or which computer. The worst part is that HDD scan and seatools for windows both show S.M.A.R.T. as good, and passes short self tests and short generic tests. I started read and verify tests from hdd scan, which were good until I cancelled them (~5%). I'm running a long generic test from seatools now overnight, but it looks like it will pass... Very frustrated with this. Would like to RMA, but can't without a valid failure. No firmware updates either for it. If you use this drive, please verify the files. As always, test your backups. Pros: The Seagate Backup Plus Fast 4TB is an absolutely terrific external portable Hard Drive. Having 2 2TB Hard Drives in Raid-0 has to be the best idea ever for an external portable Hard drive, I was so excited upon receiving The Seagate Backup Plus Fast, this is a truly innovative product. I am going to keep this review somewhat short, The Seagate Backup Plus Fast is very solid and is well constructed and feels of great quality. It contains 2, SAMSUNG Spinpoint M9T ST2000LM003 2TB 5400 RPM 32MB Cache SATA 6.0Gb/s 2.5" with an "Average Seek Time of 12ms" and an "Average Latency of 5.6ms", and all the Reviews I have read regarding these Drives have been terrific, I do not think I seen one bad review. Cons: I can honestly not think of one bad thing to say about The Seagate Backup Plus Fast 4TB, I think it is a terrific , innovative design and I truly love this product. Other Thoughts: I did a few tests with The Seagate Backup Plus Fast 4TB, 1st with ATTO Disk Benchmark I received a steady 200 MB/s both Read and Write, and with AIDA64 Disk Benchmark Read Test Suite I received a max transfer speed of 210.9 MB/s and an Average Read Access of 0.00ms! and I was completely enthralled with these results. 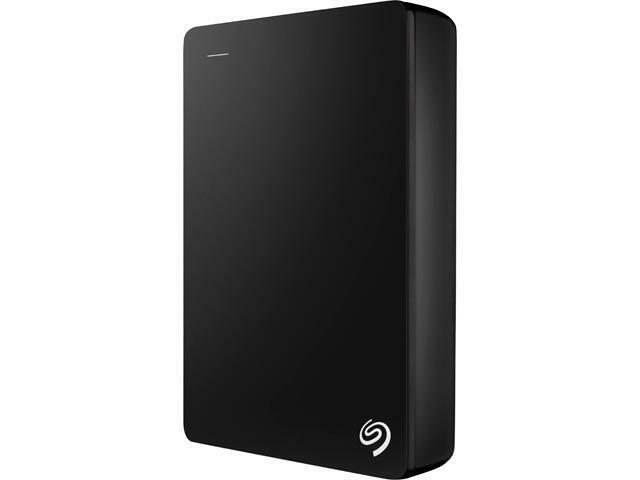 The price point of The Seagate Backup Plus Fast 4TB is awesome, it is actually cheaper to buy the Backup Plus Fast than to buy the Drives themselves and I think you would have trouble finding a Raid-0 to USB3 adapter, and if so, how much would that cost you. Like I mentioned before this is a terrific and innovative product at a great price point, and you will be very satisfied with The Seagate Backup Plus Fast 4TB.